Modern-day Arlington County is a center for government institutions and a critical part of the Washington, D.C. community. But the identity of the area goes far beyond the influence of the nation's capital. During the War of 1812, the original copy of the Declaration of Independence was hidden from the British in a local area gristmill. Arlington was the only county in Virginia to vote against secession, despite being home to Robert E. Lee. In the 1950s, a young Jim Morrison was raised partly in Arlington. The county even boasts an infamous $1 million bus stop. 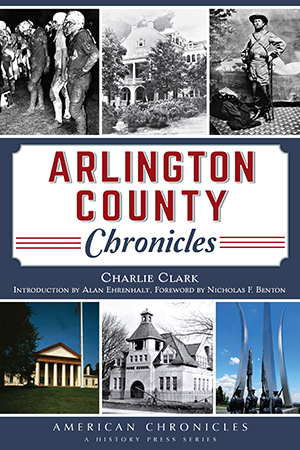 In this collection of his most funny and fascinating columns, local author, historian, journalist and "Our Man in Arlington" Charlie Clark regales with stories of politics, personalities and everything in between. Charlie Clark is a Washington-area journalist with over three decades of experience and has written the weekly column "Our Man in Arlington" since 2010. He has been a writer and editor for the Washington Post, National Journal, Congressional Quarterly and Time-Life Books, among others. He frequently speaks on Arlington history and is a committed member of the Arlington Historical Society. An avid traveler, Charlie makes his home with his wife, a historical librarian, in Arlington, Virginia. Alan Ehrenhalt is a distinguished political scholar and writer. He has served as the executive editor of governing since 1991. He has written four books as well as contributed to the New York Times Book Review and Op-Ed page, USA Today, the Wall Street Journal and the Congressional Quarterly, among many other publications. He has been a scholar at Harvard, UC Berkeley, UCLA and others and has won awards for his contributions to political science and public administration. Nicholas Benton is the founder, owner and editor of the Falls Church News-Press serving Falls Church, Virginia, Fairfax and Arlington County as well as parts of Washington, D.C. Founding the newspaper in 1991, Benton has twice served as president of the local chamber of commerce, has been named one of Falls Church's "Pillars of the Community" and has been named the "Business Person of the Year".